Today morning found me walking to the bus stop as usual. This usually involves crossing the highway we call Mombasa Road, where we don't have foot bridges. Perhaps, there would be foot bridges if the government did not have to spend money on designing logos, branding stuff and Mercedes Benzes for visitors. Government aside, I usually check if there are lots of people at my bus stop, and if so, do a 10 minute walk to the next one. See, our bus stop has too many people at peak hours which means you have to spent 30 minutes there or start off your day with a short run, after a bus. 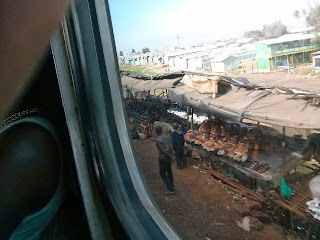 I decided to walk to the next bus station, and pass by the Imara Daima railway station. Today, it might be operational, unlike yesterday when it did not operate. See, government and parastatal (and parastatal-like-private-firms) employees are notorious for doing much, much of nothing. But guys underestimate their importance. One of these guys may fail to turn up at work, and a whole government body will grind to a stop, which will cause another semi dependent body to not work etc. 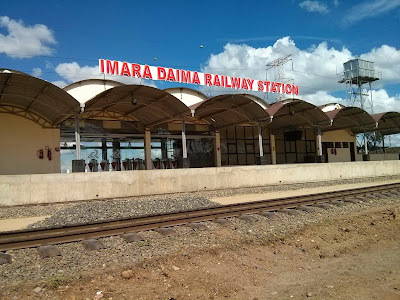 At Imara Daima, the station manager of some important person with a title that doesn't sound as critical had failed to turn up, and therefore the station was to remain closed for its first day. 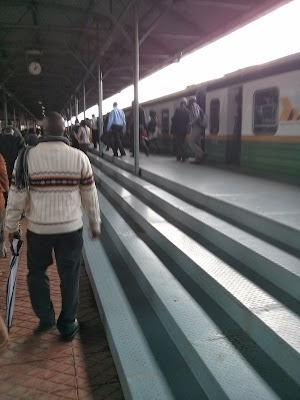 It had just being opened the previous week by one Daniel T. Arap Moi, Kenya's former president, under whose exemplary leadership (The irony of the words "leader" and "leadership" is usually totally lost on Africans) the rail system ground to a halt. The three new railway stations at Imara Daima, Makadara, and Syokimau were all built under Moi's successor, one Mwai Kibaki. He did do well, to be frank, but I feel stuff could have been built faster. We did get our tickets at ticketing windows at the train station. Ticketing services are offered by KAPS (Started off as Kenya Airport Parking Services before demand for their services went beyond the airport, their competitors are ), who also do offer parking ticketing services at most malls and parking lots in the country. Tickets are dubbed as "return tickets" but what this means is that a single ticket is valid for 2 trips in 7 days (or 5 working days as the train does not operate weekends and public holidays). The bottom of the ticket was printed a 'Free' WiFi password "1234" which does not work as most WiFi routers do not accept passwords less than 8 characters. The 9:19 am train charges KSh. 80 for a return ticket. Interestingly though, this one sold me a one way KSh. 40 ticket, rather than a 2 way KSh. 80 ticket. Edit: I've gotten one way tickets at KSh. 40 both times I've used the 9:19 am train, will try to see if one way tickets for the 7:10 am peak train. Further Edit: All tickets at 7:10 am seem to be two way. The evening trains though sell one way tickets. We were a bunch of us, somewhere between 50 and 100. There was however only 1 car in the "pay, park and ride" parking lot which is supposed to handle 150 cars. 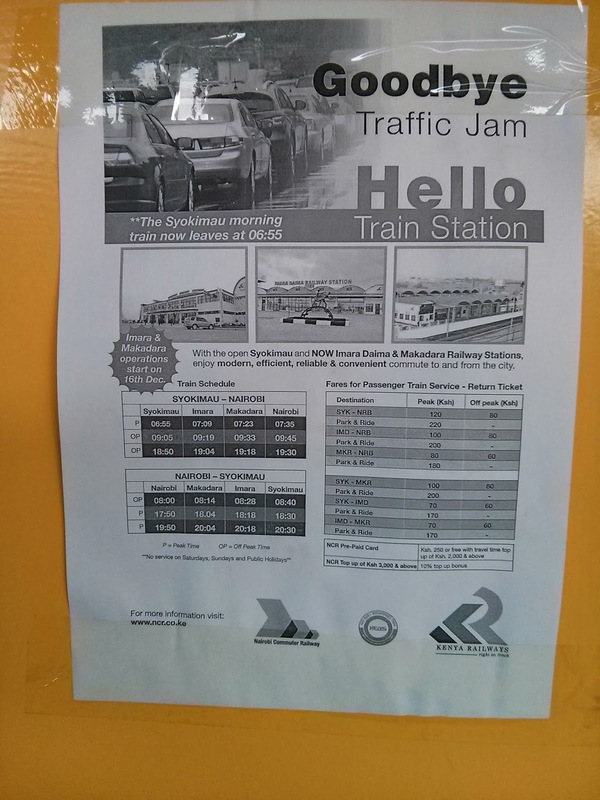 The train schedule says the train departs at 7:10 am in Imara. It arrived at 7:07 am. The train cars have been refurbished with new interior, with what should be steel floors and upholstery. It is however designed such that most of the passengers will be standing, with seats along the side of the train, and standing bars and handles in the middle. The front of each carriage has 3 seats reserved for people with disabilities. Being December, volumes are low on the train, but the 7:10 am train mostly has standing space by the time it gets to Imara. 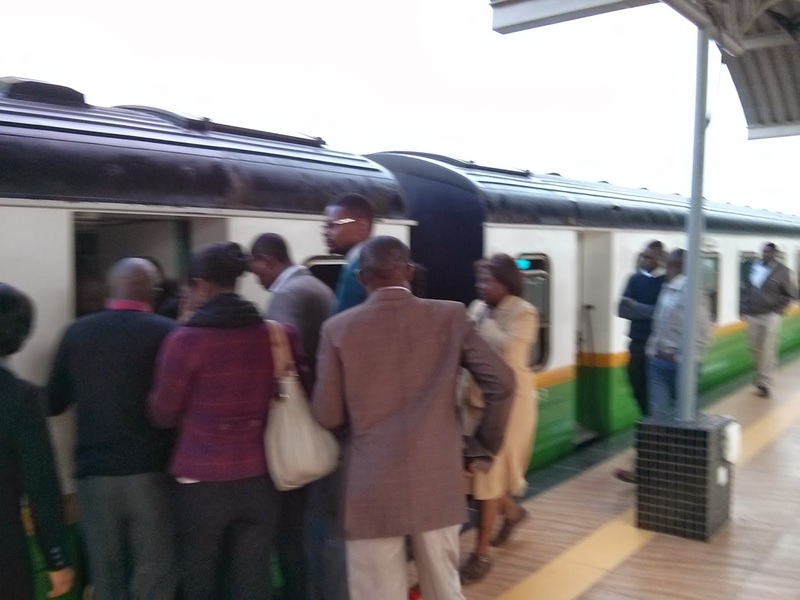 I'm told that normally the train is full when it departs from Syokimau and in the evenings for both the 7:50 pm and 5:50 pm trains. There are plans to increase the number of carriages by about 2, but this might not be enough. This also presents another challenge in that the steel platform in the CBD can not fit all carriages at the moment, though one can make their way to the next carriage to alight. Edit: The first week of operations also saw issues in ticketing. I once arrived just in time for the 9:19 AM train and found a long queue of people at the ticket line, which seemed to be stuck. 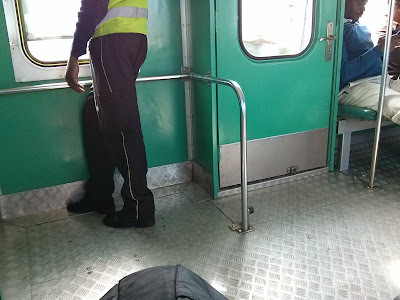 They were issued with blue slips, which they redeemed for the remainder of the tickets (having been sold 2 way tickets) at the Nairobi Railway Station. The same day also did not see us queue to have our tickets scanned once we alighted. 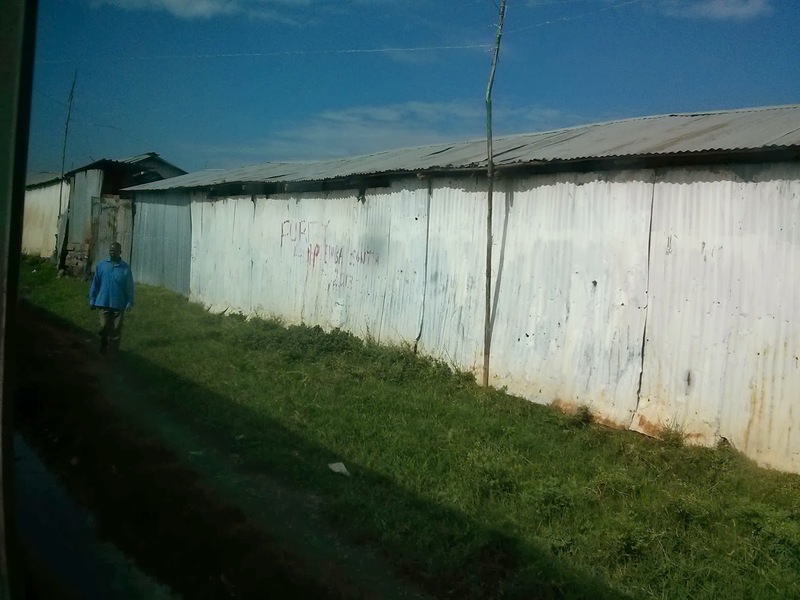 The journey to the CBD makes its way mostly through informal settlements between Imara and Makadara. 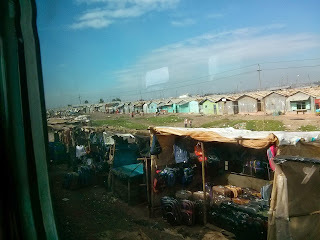 The mabati structure have encroached the rail line, with a mabati market at some point going over a bridge alongside the railway. Makadara to the Nairobi Railway Station is mostly railway land. The Makadara Railway station is quite a large station, but with most of the rail lines disused and overgrown with grass. Theres a short stretch of line that goes along city stadium. This, like most of the line has shacks along the line. The train's motion consists of a lot of swaying, which starts immediately you leave the Imara Daima railway station. The swaying is not as bad to throw you off balance, but you can observe the carriages sway in opposite sides, possibly due to the narrow railway line. The ride itself is a slow to medium speed one. Interestingly, the train still gets to the next station on time, and takes a maximum of 25 minutes to get to the Nairobi Railway Station from Imara. It is still the fastest way to get to town, including the 25 minutes it takes me to get to the station. At the destination, you still have to queue and scan your ticket. Apparently, this is to counter fraud where people may pay for a shorter trip than they intend to take, and also to check on instances where 2 people share a ticket. I am told that if you scan your ticket at the barrier, and quickly dash when they open, 2 of you can make your way through before it closes. This, I feel can be tackled by installing a footfall counter - which counts how many people pass by for every scan. but this may take another 3 years, seeing how long it took for the Makadara, Imara and Syokimau stations to come up. Also read up on my write ups of my trips to Istanbul and to Stockholm, where I rode the Istanbul Metro and the Arlanda speed train which hits 200 kph.